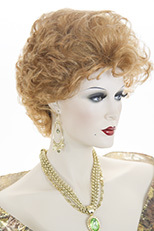 Inspired by Elvis this wig will complete your costume! Slicked back hair and long side burns. 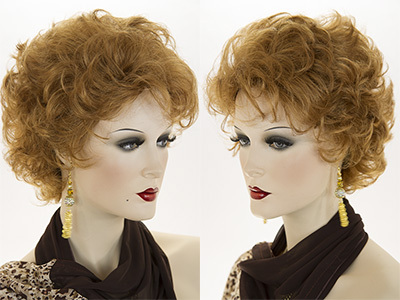 Fun judge wig! Four sausage curls on top with two pigtails on each side. 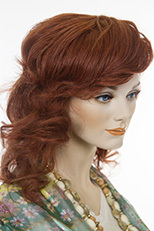 Tight curls around the front hairline. See item details for available colors. Youthful and arty! 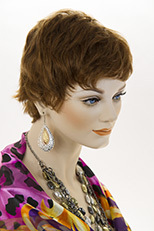 This mid length wig features a natural looking, partial skin-top, long soft S-wave with straight bangs and layered sides & ends. 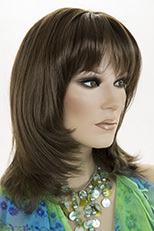 Length is 20 inches and bangs are 4.5 inches long. Featuring a natural looking center skin part. See item details for available colors. 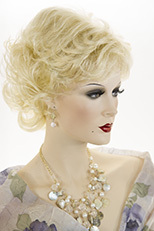 This is a Special order wig. Returns are accepted within 7 days of receipt. Special Orders are Mailed out every Friday . In unlikely event it is out of stock, Full refunds are issued. This Product used so you can pay additional fees or charges.